Summer is here, ready or not! Get those grills fired up and slather on some sunscreen. Get yourself a cold one and lounge in your grilling throne while your steaks come to the perfect level of done for you, all while you just chill! I have a product I think you are going to love. Do you can? Do you pickle? Do you roast? And I KNOW you grill! When I heard of this company I thought to myself, "Self you aren't a HUGE fan of grilling, but this is something incredible and you owe it to your grill and your food to give it a shot". I am a very honest person, lying about a product for me is NOT an option. I respect my readers to much than to mislead you, and I owe more respect to a company I review to NOT be honest. Sometimes being opinionated is a curse! Anyway, none of this is a problem here. These Fire and Flavor products are off the charts, awesome. One of the best things....? You can pronounce and KNOW every single ingredient! Simple and natural! This company was founded in 2003 by Gena and Davis Knox. They have expanded to 14,000 retail stores with their products! Incredible drive and determination I say! So, my camera decided to not transfer some of my photos to the card but delete them off my camera, I will give you such a descriptive interpretation you will swear you can taste it. You might even sweat as if you were out grilling and might need to grab a cold beer to satisfy your summer thirst! First off I tried the Sweet Ancho Chile (seasoning for oven roasted fries). Shut the front door. These are so good, don't let the fear of heat get to you, they aren't spicy hot! I squeezed a little lime juice over the top before serving as well, and shaaaa-ZAM! This seasoning, seasons 5 LBS of potatoes!!! (sweet or regular). This is my ONLY wish with this product. That they had a ziploc closure on the packaging. 5lbs is alot of potatoes MOST people won't be making that many for one meal and even though I just popped mine into Ziploc I do wish they had their own little closure thing. By the way did I mention I love their packaging? I do. For the record. I don't see any reason you couldn't put your wedges on the grill as well. I might par cook my potatoes in the micro for 5 minutes, but then oil, and season them up and throw them on the grill with your meat or fish! Retails for only $3.99! Next I tried the Crispy Icebox Dill Spices. These were great as well! I just made one container, (thank you to my fav Chinese takeout place for these great reusable containers). Look at the spices and flavor in there! There are easy directions on the back of the package. I would advise soaking your cucumbers in cold water as it suggests first, for a crispier pickle. I like crunchy pickles so that is my opinion. They are kind enough to give you directions for quick refrigerator pickles or shelf stable canning of the pickles. This retails for only $3.99! Next are the Fire and Flavor Cedar Grilling Planks. These are AwWwwwsssooOmmmmMeeeE! So easy to use and the flavor infused into my chicken like crazy! It was smokey, woodsy, and rustic, and so moist and juicy! I wish I had photos but I will insert a photo of the planks from the website. They are so easy to use, you just soak them in water. This is SO important! Don't skimp on your time, make sure they are soaked well and make sure your grill is to the directed temp. I cooked chicken because I wanted a good healthy and honest flavor to come through and I thought the mild chicken flavor would allow that. Please, try these. You can even reuse the planks, if you follow the directions on how to do so!! 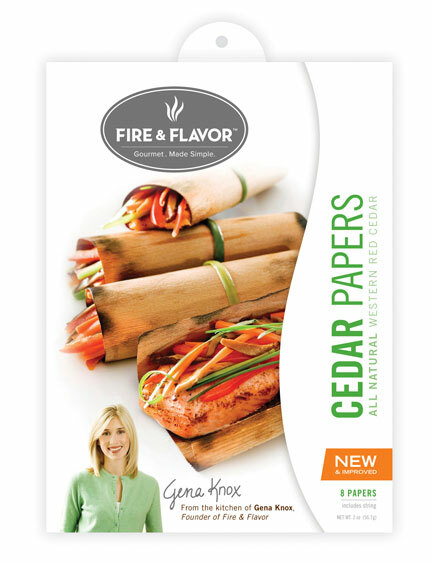 Fire and Flavor also has put out these Cedar Papers. You roll your food in them after following the directions and throw them on the fire! They are single use, and there is a recipe right on the package for you, if you like. I don't want to open the package so you will have to just read the directions if you get them! There are 8 in the package. Then there is a Salt and Vinegar Seasoning. If you follow my blogs you will know I posted a Roasted Sunflower Seed recipe. I did a second batch using some of this seasoning and it was incredible. I love seasonings I can use for more than one thing! I will be doing potatoes with them next week, my husband grew up in England, he will love them! He keeps asking me when I am going to make them! I really couldn't be happier with these products. I feel they were a complete hit, and completely worth their inexpensive price. You get so much product for the money. They deliver in every way. There is such a huge array of products, I urge you to go check them out on their website and do some shopping. Father's Day is coming! Perfect for your dad and his grilling addictions! Here is where it gets even more exciting. The kind folks over at Fire and Flavor send me some goodies to give away to one of my readers! I saved out a few cool items and added a Grilling cookbook! The rules are easy. When you have done each of these leave me a comment here saying you have done so. So if you do them all, you will have left me 5 comments! (5 entries) Got it? 1. Follow here me on Blogger. 3. Follow Fire and Flavor on Facebook. 5. Leave a comment under this blog with the product you would most like to try from their website. This giveaway is open from the minute I broadcast this blog until 6 p.m on Sunday, June 10th. I will use random.org to choose my winner. Remember when you follow me on Facebook to add FoodThoughtsOfaChefWannabe to your news feed or a list so it will show up in your news feed! I love having an interactive FB page, but with all of their new craziness, unfortunately unless you do this, I cannot reach all of you! I can't wait for one of my lucky, faithful readers to get to try these products! Make sure to get entered and thank you as always for reading and keeping me entertained with your funny food stories, photos and opinions on everything! Donna, you aren't required to have a twitter. All those ways are just different ways to get more entries! Please understand I do not think everyone has to have twitter. I only recently got it myself. There are 5 ways to enter, that is just one!! Just leaving a comment that you follow me here is 1 entry. Leave another saying you follow me on FB if you do, that is another entry, and so on! Christine...this all looks so awesome..do I really have to choose????? I now like Fire and Flavor on Facebook! I follow you on twitter now!! I would love to try the Burger Seasoning and the All Purpose Seasoning!! Thank you! I follow you on FB! I thought I followed your blog, but realized I have not joined! I am now following your yummy blog too! I would love for you to stop by my blog anytime! Very intrigued to try their cedar papers! Oh Sugar Plum. You know I already follow you on FB, I followed you on Twitter today, and I look forward to getting emails everytime to post a new post :) I think I need the Crispy Dill Icebox Spices. Mini-Me eats more pickles than I can keep in the fridge, and she cooks for 4-H, so this would be a great project for her :) Love this!! I would try the cedar papers! Liked, Liked, following, posting! I want that coffee rub from the fire and flavor website. I have yet to use a coffee based spice to my meat and have it on my "to do" list. Hope to win that lovely looking prize you got!! FINGERS CROSSED! Of course I follow you on Blogger! I follow Fire and Flavor on Facebook! So hard to choose just one...I love cedar planks, would love the cedar papers, burger seasoning, sea salt and spices, and with herbs....wow...amazing selection! I would LOVE LOVE LOVE the Cedar Planks! What an awesome company! Now following Fire and Flavor on Facebook! Going to follow you on Twitter right now! :-) YAY!! I want to try the icebox pickle spice! I would love to try either flavor of the Fry Seasonings! izardbeth if you put each of those in a different comment, it will give you more entries/more chances to win!! If you want to keep it that way it is fine, but just an FYI!! Thanks for entering! And follow your most excellent blog!!! Would totally love to try the cedar paper!!! I'm tryin the single use papers and I think I wanna get these things for my dad for fathers day.... What u think?? I wanna try the plank and those single use papers! I kinda wanna order some for my dad for fathers day too! Oh hey, and I follow you On here and Facebook! I follow you on here, Facebook. I'm following you on facebook also! For the 5th try, I'm following you everywhere.